If you look at the basic results of the county commission race between Democrat Cathy Wolfe and Democrat Karen Rogers, you can see a huge difference in the vote totals compared to other county races. About 7,000 voters did not vote in this contest between candidates from the same party. 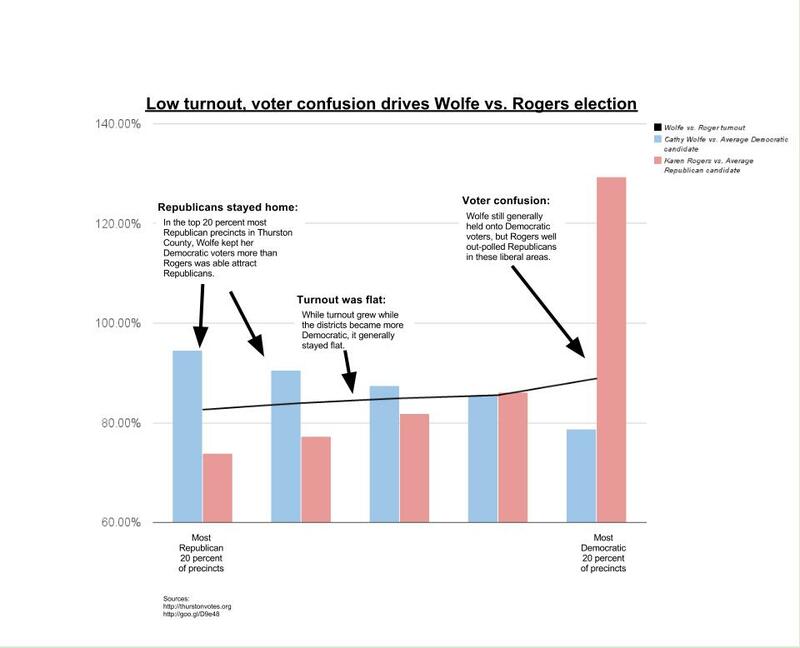 What I did was look at how Wolfe and Rogers did compared to a composite Democratic and Republican candidate in five groups of precincts. I made the composite from the results of the Thurston county level presidential and gubernatorial elections and the results of the other county commission race. I then ranked the precinct groups from most Republican to most Democratic. 1. Republicans won't vote for a Democrat, no matter how conservative they are. Rogers made some waves by getting endorsements from traditionally Republican allies and by taking some conservative stands, especially on land use. That didn't garner her Republican votes though. 2. Democrats got confused. 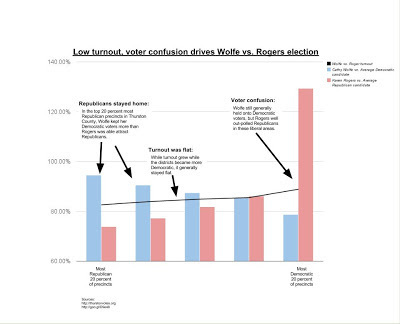 When the race moved into more liberal areas, Rogers well outperformed a composite Republican, indicating she was taking otherwise Democratic votes away from Wolfe.